I managed to cram a weekend into 29 hours with four of my favorite people on the planet. Yesterday (I can't believe it was just yesterday), I took off work at noon. I got home, got girlied-up (or as girlied-up as I get) and packed a bag. My friend Shawna (fave person #1 for the weekend) picked me up, we stopped at Sonic for Route 44 caffeine boosters and hit the road for my parents' house (fave persons #2 & #3 for the weekend). Our friend Lori (fave person #4) met us at my folks' place and then all five of us loaded up in Dad's pickup and headed to Roscoe, Texas (population 1,328). There's a place in Roscoe called the Lumberyard (it used to be a lumberyard - imagine that) that is a beer and burger joint with a big outside area where they bring in bands to play. For a town that small, they manage to get some good bands. Last night's headliner was PAT GREEN. 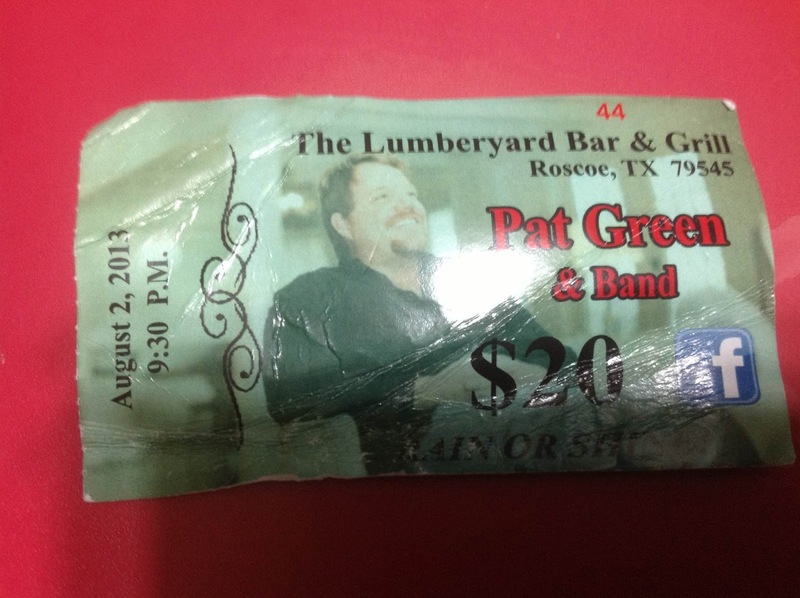 I love me some PAT GREEN. His picture is on the ticket! So adorable. But I digress...The show didn't even start until about 8:30 when the opening band came on, so we pretty much just sat there and sweat and drank beer and critiqued everyone's outfits as they walked past (we were right by the entrance, so it was like being at a redneck fashion show. I've never seen so many short shorts and boots in one place. On girls who should NOT have been wearing short shorts. But that's a post for another day). 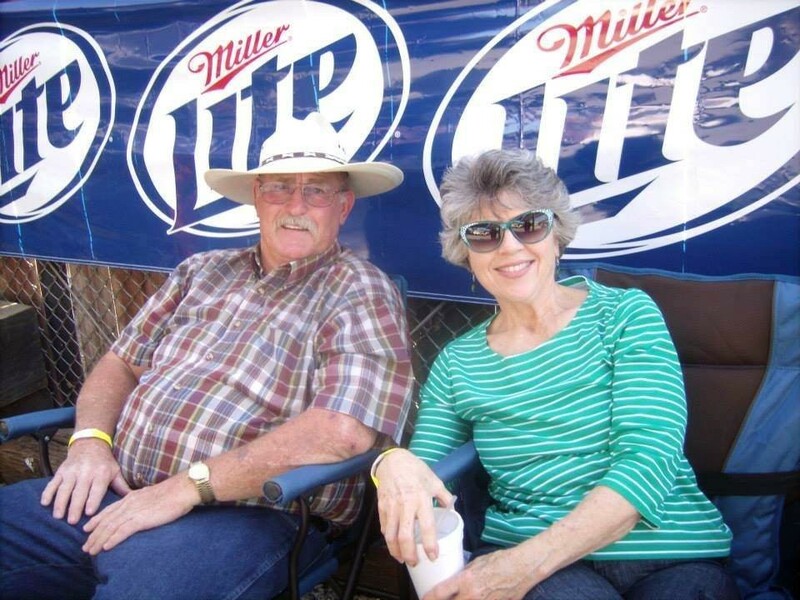 Dad and Mom looking pretty cool in the heat. Shawna, me and Lori enjoying our beverages. Anyhoo, back to my story. Finally, the opening act was done and PAT GREEN came on. Shawna, Lori and I went right up front and sang along at the top of our lungs to the first two songs. It was awesome. And even hotter because of all the people (and probably the proximity to Pat Green). Shawna, me, Lori and Pat Green in the background. Wish my photo editing skills included removing guys with red Polo caps on their big ol' melons. When the concert was over we were happy, sweaty, a little hungry and still up for fun, so we went back to where my parents live and hit the local place that does karaoke and sells snacks. We had ice cream and Shawna and I did a rocking, if not entirely tuneful, version of Blondie's "One Way or Another." And then it was time to head to Mom and Dad's house for some shut eye. This morning began with Mom making the BEST BREAKFAST IN THE WORLD - her famous sausage balls. In case you're wondering what Heaven tastes like, it tastes like breakfast sausage, cheese, Bisquick and Mom's love baked into bite-sized wonderfulness. After breakfast, we watched a cute-but-lame Hallmark movie and did some visiting. Mom, Shawna and Lori talked about cooking...alot. I think Mom enjoyed having someone around that was interested in talking about recipes. Suddenly, it was lunchtime and Dad grilled up some yummy chicken fajitas. They were so good and had Dad and Lori talking about recipes. I didn't think to get a picture of the fajitas because we all just kinda dived in. Not long after lunch, Shawna, Lori and I all headed for home. I was back on my couch and ready for a nap by 5pm. It was the best 29 hours I've had in quite awhile. Now I just need about 29 hours to recover.